This is a 6" diameter fully customizable Geometry manipulative that can be useful in the teaching and learning about the properties of angles, inscribed angles, central angles, arc lengths, and arc measures. Use with a rubber band or two to discover the relationship between inscribed and central angles . Holes for small nails are equally spaced around the circumference along with one in the center. 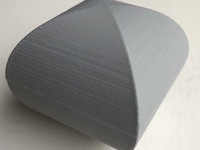 An STL file of a 6" disk that printed well is also included if you don't want to mess with the customizer. 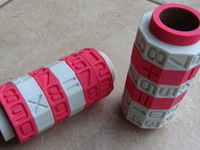 If you like this, check out my other objects, including the non-customizable version of this manipulative at: http://www.thingiverse.com/thing:2179477. Also, If you want a modification to this design, let me know in the comments and I'll see what I can do. Updated 3/19/17 - A new version was modeled in Inventor (see the Version 4 STL file, not added to Customizer file yet) that has 24 central angles (15 degrees each) around the whole circle, along with 12 inscribed angles radiating 180 degrees from a single point on the circumference (7.5 degrees each). The intent is to better show the relationship between central angles and inscribed angles. 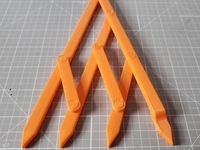 Pass out these inscribed angle manipulatives after teaching students about the relationships between inscribed and central angles. allow students to explore relationships between radii, arc measure, and angles. enough nails to fill all the holes. Short nails are preferred with diameter approximately the same as hole diameter, tight fit good to keep nails secure.